John Emmett (Sterling Hayden) is on a road trip from California to Texas to see his family when his car breaks down. As luck would have it, he meets a friendly woman named Ann (Ruth Roman) who is willing to give him a lift if he’ll drive at night while she sleeps. Everything seems peachy at first, but John soon learns that Ann’s situation is complicated. A woman approaches him in a diner while he’s enjoying a cup of coffee and tells him that Ann is a widow who has had a nervous breakdown. The truth is, she’s on the road because she’s running from a man named Dr. Simmons and from the police, who want to question her about the murder of a CIA agent. And the woman who approached John with the “truth” is actually a sneaky-snake that is working with one of the men who is tracking down Ann. So as Ann and John continue along on down the road, they’re trailed by everyone from evil enemy agents to the FBI. Drama and thrills ensue. Henry S. Kesler directs 1957’s Five Steps to Danger. Kesler also wrote the screenplay from a Saturday Evening Post serial, The Steel Mirror by Donald Hamilton. 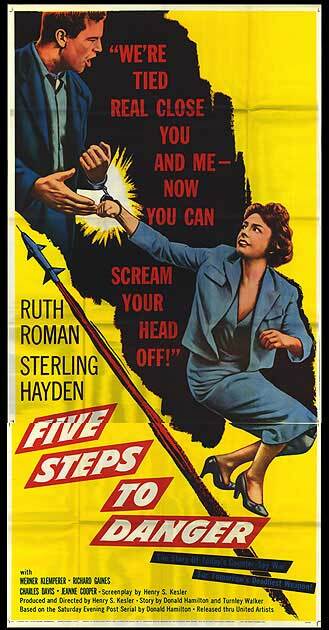 Five Steps to Danger is an interesting little film. Ann’s situation seems to just continue building upon itself and becoming more complicated. Joe first knows her simply as a friendly married lady who is willing to help him… then she becomes a widow in his mind, then a woman wanted for questioning in a murder case, then a German woman working on some shady business in America, and so on. Ann reveals small truths (or are they truths? The audience can never be completely sure) as the film progresses. 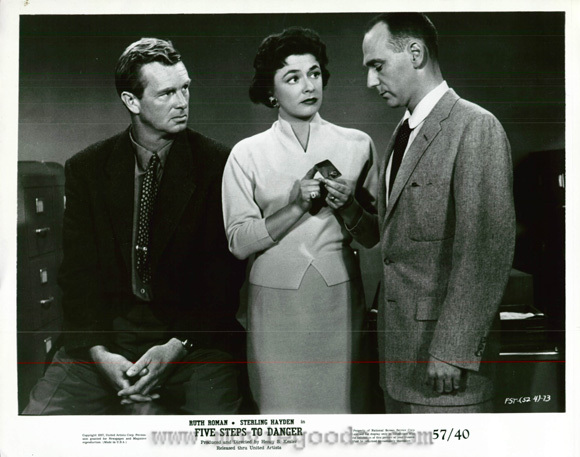 Ruth Roman is quite good in the role of Ann, and she carries the film well. Though the viewer is not sure whether to trust her completely (especially in times when Joe becomes highly suspicious of her), Roman’s delivery lends a sense of sincerity to the character which makes us more inclined to believe that she is trustworthy. Sterling Hayden’s performance isn’t quite as solid. There’s something about his delivery — not consistently, but in certain conversations, like his argument with Ann in a hotel room about whether Dr. Kissel exists — that seems unnatural. I know that Hayden is capable of more than this, so I was slightly disappointed by him, even though his performance was nowhere near bad. As we learn more about Ann, the film undergoes a couple of transitions. When we know little about her the film seems like a standard “runnin’ from the law” story, but it soon becomes much more politically charged as we learn about what Ann has been doing in America, and the level of tension grows as we learn more about her as well. Crime drama and spy drama merge to make up an engrossing tale. I also caught this one streaming on Netflix…a fun little film to watch when there’s nothing else to do on a slow Friday night. Another one I’ll post on my site when it returns from the dead!